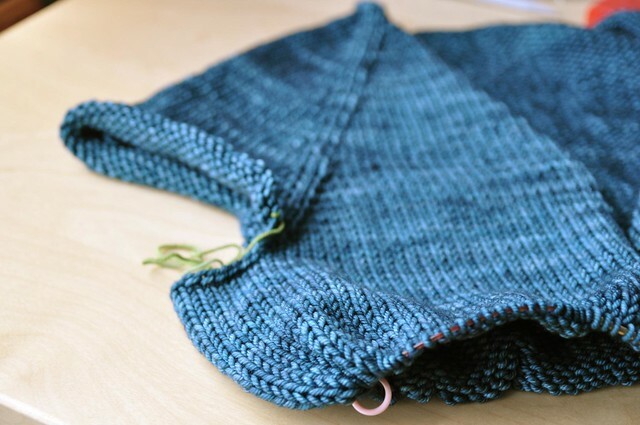 My teal cardigan is past the yoke split! I love that part. I’m nearly through 2 of the 3 skeins of the teal that I have, so now I need to decide what to do – I have a skein of a blue and one of a sandy grey, which I want to incorporate somehow. Stripes with the blue, maybe. 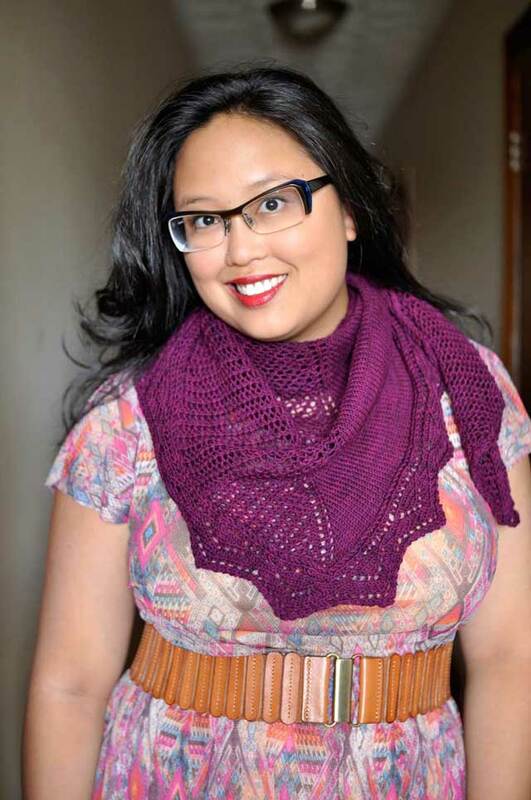 Or some kind of lace pattern that uses 2 colours? 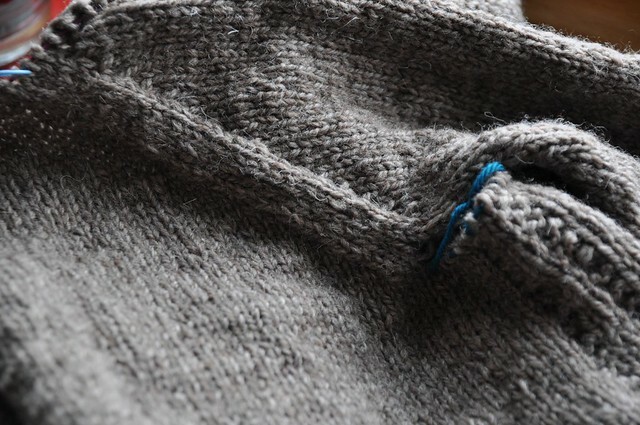 I finished the yoke of D’s cardigan, but now I have to wait for more yarn! I hope the new yarn matches, but since it’ll be for the buttonband and shawl collar, it should be ok if it’s slightly different. 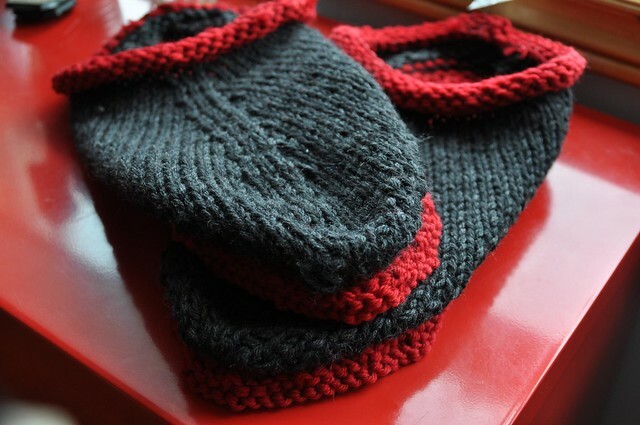 I finished a pair of clogs! Super quick and satisfying (though the large needles did irritate my arm somewhat). They’re hilariously large, of course! Now to get them felted. I actually have a pile of woollens that need washing and blocking, I should really get on that. For a change of pace from knitting, I started a Colette Zinnia skirt yesterday. I got through the printing out, taping (which I do kind of love, it’s like a very easy puzzle), cutting, and pleats yesterday. And yes, I’m sewing it by hand! I’m making version 2, the shorter one with pleats and pockets, but omitting belt loops. 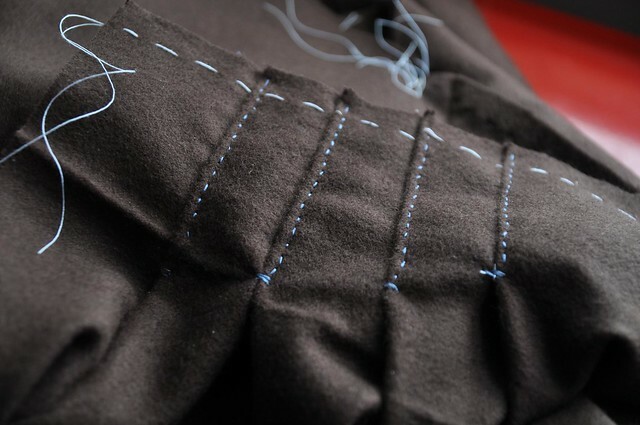 Turns out I didn’t have any brown thread though, so I’m using blue for the visible stitching and dark grey where I want the stitches to be less visible, like inside the pockets. I’m using a chocolate brown flannel, and it’s soooo soft. I do think it’ll be a bit ‘sticky’ to wear with say, leggings, but should be ok with slippery tights or leggings and a slip. I actually did want to do a lining, but I don’t have any suitable fabric. Maybe next time! I’ve had my eye on the version of the skirt with all the buttons. How are you liking the pattern? The sweaters look great!